Below are links to some examples of websites we have created. 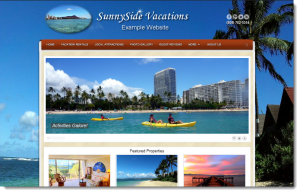 These sites are integrated with Vacation RentPro, and provide all the features required for vacation rental websites, including Full property details, SEO optimization, Social links, Search capabilities, etc. In addition, the websites we create are state-of-the-art CMS (Content Management System) enabled. This means that you are able to update your pages, news articles, menus, etc. – without having to continually pay someone to do it for you. This provides the best value, and is in line with our goals of providing our customers with the tools they need for a low, one-time cost of $1,195 with No Recurring Fees required from us. Please feel free to call if you have any questions (808) 782-5054.